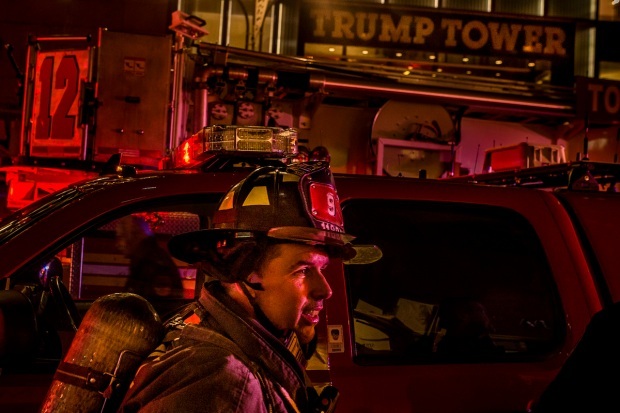 A fire erupted on the 50th floor of Trump Tower Saturday evening. Authorities are investigating what caused a raging fire that tore through a 50th-floor apartment at Trump Tower, killing a man inside and sending flames pouring from windows of the president's namesake skyscraper. FDNY Commissioner Daniel Nigro said the cause of Saturday's blaze is not yet known but the apartment was "virtually entirely on fire" when firefighters arrived after 5:30 p.m.
"It was a very difficult fire, as you can imagine," Nigro told reporters outside the building in midtown Manhattan. "The apartment is quite large." Todd Brassner, 67, who was in the apartment, was taken to a hospital and died a short time later, the NYPD said. Property records obtained by The Associated Press indicate Brassner was an art dealer who had purchased his 50th-floor unit in 1996. Brassner was an art collector who spent time with Andy Warhol, but fell on hard financial times in recent years and went through bankruptcy proceedings. He is mentioned several times in Warhol's posthumously published diaries, with references including lunch dates and shared taxis. The artist signed and dedicated at least one print to him. But in recent years, Brassner came upon money difficulties. According to documents, his family had stopped helping him pursue buying and selling art at the end of 2014, and in the last few years he had been "plagued with debilitating medical problems that have made it difficult for him to function." Neighbors said Brassner was also a guitar collector. One neighbor who lived next door to him said the two of them rarely crossed paths but that she sometimes heard him playing guitar. Officials said four firefighters also suffered non-life-threatening injuries, including burns, and that several units above Brassner's apartment had smoke damage. Asked if Trump's assessment was accurate, Nigro said, "It's a well-built building. The upper floors, the residence floors, are not sprinklered." Fire sprinklers were not required in the city's high-rises when Trump Tower was completed in 1983. Subsequent updates to the building code required commercial skyscrapers to install the sprinklers retroactively, but owners of older residential high-rises are not required to install sprinklers unless the building undergoes major renovations. Some fire-safety advocates pushed for a requirement that older apartment buildings be retrofitted with sprinklers when New York City passed a law requiring them in new residential highrises in 1999, but officials in the administration of then-mayor Rudy Giuliani said that would be too expensive. Trump was among the developers who spoke out against the retrofitting as expensive and unnecessary. It's not the first fire at Trump Tower this year. In January, three people were injured when a fire broke out in a cooling unit on the roof deck of the building. That fire also sent smoke billowing over Midtown. Nigro noted that no member of the Trump family was in the 664-foot tower Saturday. Nigro said firefighters and Secret Service members checked on the condition of Trump's apartment. About 200 firefighters and emergency medical service workers responded to the fire, he said. Some residents said they didn't get any notification from building management to evacuate. Lalitha Masson, a 76-year-old resident, called it "a very, very terrifying experience." Masson told The New York Times that she did not receive any announcement about leaving, and that when she called the front desk no one answered. "When I saw the television, I thought we were finished," said Masson, who lives on the 36th floor with her husband, Narinder, who is 79 and has Parkinson's disease. She said she started praying because she felt it was the end. "I called my oldest son and said goodbye to him because the way it looked everything was falling out of the window, and it reminded me of 9/11," Masson said.